Why would anyone want to make lasagna in their dishwasher? Why would anyone want to see how many people can be packed into a Volkswagen? Or crammed into a phone booth? Are there still phone booths? There are still public phones in France, both pay-phones and free-phones for emergencies, but they're not in booths. If there are no phone booths, where does Superman change? Would the current equivalent of stuffing college students in phone booths be seeing how many could dance on a mobile phone? What about flagpole sitting? Goldfish swallowing? Where have all the fads gone? Back to the lasagna in the dishwasher. The difference between stuffing people in a Mini-Cooper and dishwasher baking is the first does not run the risk of wasting a perfectly good lasagna. I made the unilateral decision of not electing to post the procedure for making dishwasher lasagna, although the person who sent the (unsolicited) e-mail and link to me assures me that you would all be utterly fascinated and forever in my debt should I do so. Don't try these in your dishwasher – they really need a barbecue. Sauce: In a small saucepan gently heat all ingredients for barbecue sauce, except oil. When warm, remove half of the sauce to a bowl. Add oil to the bowl to make the basting sauce. Chicken: Rub thighs with oil and sprinkle with salt and pepper. 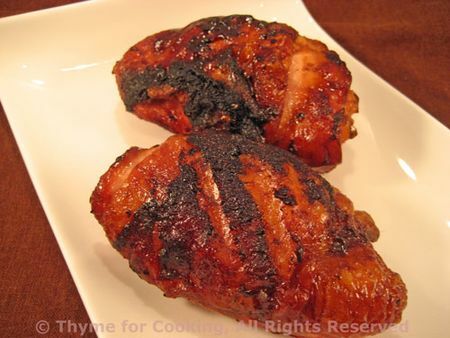 Cook thighs on barbecue grill for 25 minutes, turning once or twice. Start basting after 10 minutes and baste 2 – 3 times. They'll be done when they are nicely browned and the juices run clear when pierced with a knife. Serve with remaining barbecue sauce on the side. week of June 25 we have Tomato, Caper and Herb Salad, Grilled Whole Trout, Lamb Chops Dijon, Southwestern Salad with Grilled Sausages, Chilled Zucchini Soup…. 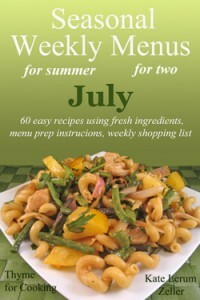 is a Weekly Menu Planning Service focusing on healthy, seasonal foods. seasons available for Australia, and others in the Southern Hemisphere). I think nearly anything would taste good of the grill, eh? Just sayin’. Your barbecued chicken looks wonderful. No big surprise there. Today, I think the fads are all online – viral YouTube videos, things on Facebook that everyone adopts and posts, etc. Not nearly as much fun as finding out how many college students can be stuffed into a VW Beetle. Cindy, you are sooo right! I love summer cooking. Elizabeth, we don’t have one either, well, I do – mon mari… We had one, once, used it for storage. I’m a chicken thigh convert! Zoomie, It was more fun when there was actual human to human interaction, wasn’t it. Nothing like a foot in the face to make one feel connected. Well, sockeye is in season, and I actually remember my mother cooking a whole fish in the dishwasher (as the recipe in the weekend paper suggested). Island Vittles, Fish in a dishwasher? I don’t think so…. was it good? Jeanne, it really makes one wonder, doesn’t it? I mean, why?